Do you ever wonder what your shadow is up to when no one is looking? You've noticed that it's not there sometimes, haven't you? We've been thinking about it and we're pretty sure our shadow has more fun than our color-bound body. Just think about it. Our shadows would blend in perfectly in, well, the shadows. So they can get pretty much anywhere without being spotted. That means free admission to movie theaters, cool high-end jazz clubs, and your local planetarium. Oh, and all those stories about ghosts that we've been hearing over the centuries? Those are probably our shadows, joyfully causing havoc all across the world. In fact, take a second and look down now. See your shadow? If not, it's probably being filmed for one of the ghostly reality shows as you read this. Wow, your shadow might just get famous! 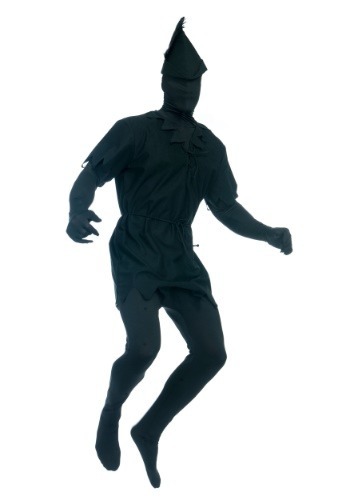 This costume doesn't represent just anyone's shadow. It represents one of the most famous shadows in history, Peter Pan's shadow. You'll look just as dashing as Pan's dusky cohort with the jaunty cap that will set you apart from any other boring shadows. 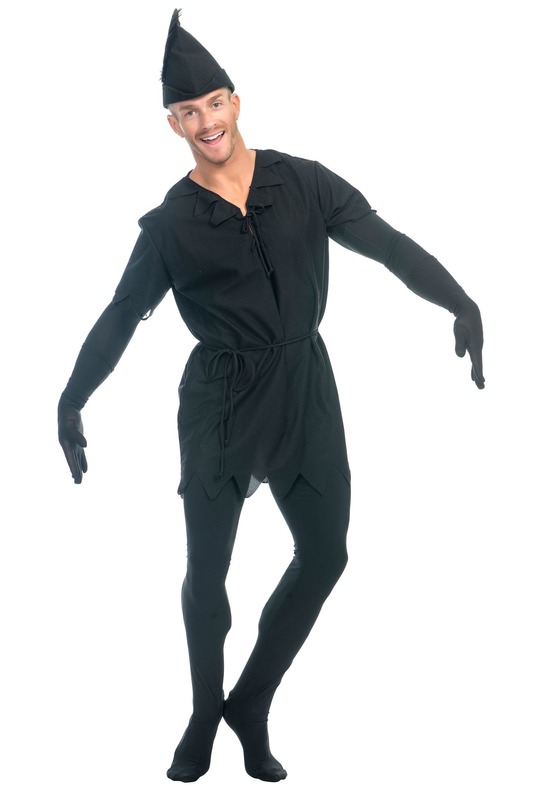 This costume includes a zippered skin suit, fully covered hands and feet, the tattered Peter Pan hem, and a hood that covers your face when you're going incognito and can be pulled down when you need to eat, drink, or see well. Peter's shadow self is far from nefarious but he sure is mischievious! Once you're getting in touch with your shadow side, life is about to get more interesting. We wouldn't suggest trying to sneak into places because you simply aren't an actual shadow with those top-notch sneaking abilities. However, we would suggest you flaunt your awesome costume to the world. Pair up with full-color Peter and the Lost Boys or simply go off on your own. After all, you're a shadow, you do what you want!